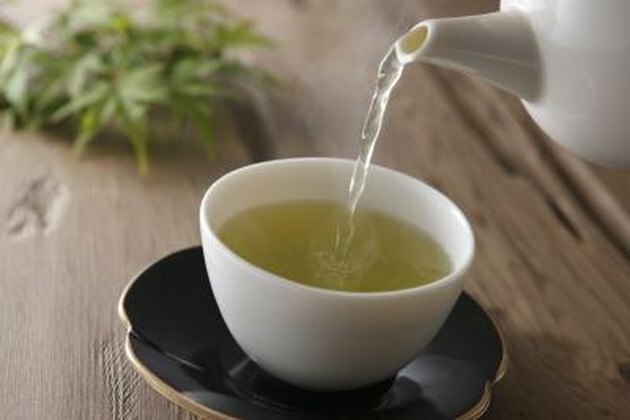 After water, green tea can be considered the most popular drink in the world. Asian societies prize the partially fermented leaves of the camelia sinensis, and green tea can be found as a part of many cultural ceremonies in both China and Japan. The brew has recently gathered more attention in the Western world as both a healthy alternative to black tea and as a promising weight loss aid. One of the touted benefits of green tea centers around its alleged ability to suppress appetite. Green tea appears to demonstrate the ability to suppress appetite, although a number of mechanisms may be at work. The major appetite suppressant factor lies behind its effect on norepinephrine and dopamine. These two peptide hormones, known as catecholamines, activate the sympathetic nervous system; one of the known effects includes a reduction in the desire for food. Researchers believe that ECGC, one of the most active compounds in green tea, mediates this effect by inhibiting the breakdown of an enzyme that would normally break down the catecholamines. One of the methods employed by the body to manage appetite involves the production of CCK. This hormone, released in the intestines after the consumption of a meal, tells the brain that the body has received adequate amounts of food. The release of this hormone immediately reduces appetite. The consumption on green tea increases the release of CCK. Beyond its effects on appetite, green tea demonstrates further effects on fat burning. The polyphenols contained within green tea, which include ECGC, increase thermogenesis, preferentially burning fat in preference to protein. Studies compared the rate of fat burning in a group that consumed green tea against another group that did not. They found that polyphenols contained within the brew performed well. While energy expenditure from fat in the control group only amounted to 31.6 percent of total energy use, this rose to 41.5 percent in the green tea group. Unlike other fat-burning agents, green tea does not exhibit damaging effects on the cardiovascular system. Because most thermogenic agents act as stimulants, side effects such as increased heart rate and anxiety can occur. Green tea provides a high level of antioxidants, which may boost the health of the heart and arteries, and the high content of the amino acid theanine can provide calming effects on the user. Dr Joseph Mercola, a physician certified by the American College of Osteopathic General Practitioners and a best-selling author, advocates the use of green tea for the prevention of many chronic ailments. Researchers do not associate many side effects with green tea, even in very large amounts. Studies have shown that signs of toxicity only occur when intake reaches the equivalent of 1,200 cups per day in a 150-pound individual. It has been proposed that the high polyphenol content of green tea could disrupt mineral absorption, with possible inhibition of vegetarian sources of iron. Does Caffeine Constrict Blood Vessels?